AN INSTRUMENT WITH A LONG HISTORY: The original shofar horn has been used for over 4000 years for Jewish religious and spiritual purposes. This unique musical instrument uses the power of wind and it emitsa mysterious, uplifting, and reassuring sound that touches your soul and makes you feel connected to God. AN AUTHENTIC SHOFAR HORN: Made with the raw horn of an animal of the Bovidae family, this Shofar is 100% authentic and natural. The HalleluYAH Shofar horn is sterilized, polishedandin excellent condition,and it has been carefully designed to create the deepest sound. FEELTHESPIRITUAL CONNECTION: Once you blow the wind instrument or listen to its mysterious sound, you will immediately feel connected to the cosmos and the power of The Creator. The Shofar will uplift your spirit and you will feel closer to the divine âall it takes is one powerful blow. 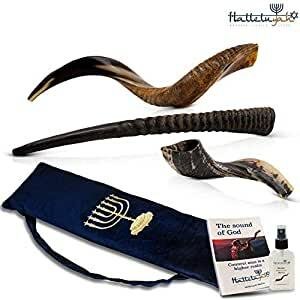 USE IT ON MULTIPLE EVENTS: Spiritual ceremonies, the Jubilee, the beginning of a new year, praise to God, before, during and after the Musaf prayer on Rosh Hashanah, the end of Yom Kippur, every weekday morning in the month of Elul âyou can use the Shofar on many different occasions and religious events. CRAFTED IS ISRAEL:The HalleluYAH Shofar horn has been made in Israel by experienced and skillful crafts people. The art of crafting the Shofar is based on ancient knowledge kept for thousands of years, so you can be 100% sure that this is an authentic Shofar! The Shofar has been mentioned in many religious and historical testaments. In fact, it has been used for more than 4000 years by Jews and Evangelists for religious and spiritual purposes. You Can Have An Authentic Shofar Yourself! HalleluYAH proudly present you with this authentic Shofar made with the raw horn of a bovid animal. Skilled craftspeople have created this traditional wind instrument in Israel using ancient knowledge and techniques. The horn has been carefully picked, sterilized, crafted, drilled and polished, in order to become an authentic Shofar! Feel The Power Of The Shofar Sound Inside You! Whether you blow the Shofar or you simply listen to its mysterious sound, you will feel the same thing âa spiritual uplift. The Shofar has been used for years for many different sacred ceremonies and religious sermons to help people feel connected with the Creator. So if you need to feel a spiritual connection to God, all you have to do is let the deep sound of the Shofar fill your ears, mind, and soul! In order for the Shofar to be authentic and natural, it needs to be made with the purest horn that is in the best condition. With HalleluYAH you can be 100% sure about the quality and authenticity of this musical horn âso donât hold back! Scroll Up And Click The âAdd to Cartâ Button NOW!